Free Printable Pokemon Word Search. Free Printable Pokemon Word Search, a fun activity for all the Pokemon fans. Take a break finding Pokemon with Pokemon Go game and have fun searching your favorite Pocket Monsters and words related to Pokemon. Share it with all your friends, students, fans, parents, neighbor, teachers. Find names and monsters from Pokemon like Ash Ketchum, Pokeballs, Lucky Eggs, Arceus, Mewtwo, Nintendo, Incense, Gems, Picachu, Palkia, Dragonite and more. The easy word search includes 24 Pokemon words and the answers on page 2. 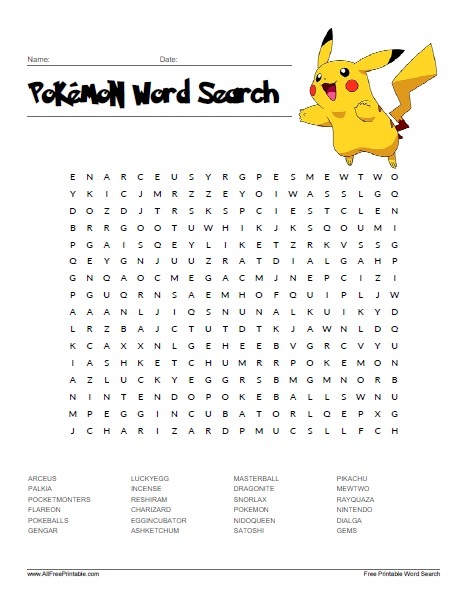 The Pokemon Word Search Puzzle is ready to print in PDF format. Can you find them all? Yes, you are right is Reshiram, it will be corrected soon.